People will be shocked to find that environmentally sensitive areas of land around Tonge Mill, St. Thomas Becket's Spring that feeds it and the entirety of the new country park for the Stones Farm development in Bapchild are also included. I would imagine that developers Hyde New Homes and Westerhill Homes as well as future residents are going to be extremely concerned that what is deemed the essentially mitigation for developing the Stones Farm site in the first place has already been severely compromised, casting doubt about whether any of it will now be delivered. The impacts of this are significant as this land deals with the water run off from the development as well as providing separation between urban Sittingbourne and Bapchild. Ironically the separation of developments using green space is a significant part of the Garden Town philosophy, so for a Garden Town to destroy another development’s green space is unfathomable. So why would Quinn Estates bother, surely, it’s not relevant to their scheme? Quite simply, this is to facility the only route for the completion of the Northern Relief Road that the Council is interested in. Only one potential point to cross the railway line has been included and that is slap bang right through the middle of the new country park. The new home owners and the residents of East Hall Farm can look forward to a towering flyover, and the best bit is that none of us will ever be consulted as the scheme becomes its own planning authority. Whether Quinn Estates can successfully argue that the Highsted Park scheme is dependent on the delivery of the Northern Relief Road remains to be seen, but clearly this is more about fulfilling the ambitions of the Councils Local Plan than delivering infrastructure that is strictly necessary for this development. So, what are Garden Towns? Garden towns are classed as developments of more than 10,000 homes which are supposed to be discrete new settlements, and not an extension of an existing town or village. They are meant to be self-sustaining with their own town centre and public realm including retail opportunities, recreational and community facilities. They should support the necessary infrastructure to allow the community to function self-sufficiently on a day to day basis including access to road, rail and utilities. Well that’s the sales pitch, the reality however frequently falls woefully short of expectations and often fails to meet many of the key garden town principals drawn up by government and yet the government persists in allowing these projects to proceed. Any developer can, apparently, classify their development a garden village. One of the primary goals of the whole Garden Town philosophy is to obtain land below its commercial value creating an uplift to pay for community infrastructure and affordable housing. In this case the community infrastructure is almost exclusively transport orientated, providing a new motorway junction and Southern Relief Road. However, when it comes to affordable housing it spectacularly falls short of delivering the 40% affordable housing required in the current Local Plan, unless this entire enterprise were classified as an urban extension which would then only require 10%. Quinn Estates as you have probably guessed by now are only proposing 10% affordable housing so therefore clearing acknowledging that this scheme is an urban extension of Sittingbourne not a garden town. Due to its unimaginably large size it will also significantly impact the borough’s affordable housing delivery to a point where the Council ends up developing far fewer affordable properties than we are currently building even though we face more than doubling the housing provision in the local plan. Presumably in a bid to keep developers happy the Council has significantly lowered the bar for affordable housing requirements in the two areas of the borough where the majority of the housing is planned. Ranging from nothing on the Isle of Sheppey to a meagre 10% in Iwade and in urban Sittingbourne. Previously we had 30% target across the board, but at least now developers will have less to do as we slowly drift towards zero affordable housing provision. Clearly it is blatantly obviously to anyone casting a casual eye over a map that this is a huge scale urban expansion of Sittingbourne and certainly not a new garden town, garden village, garden community or anything else prefixed with the word garden. So just like many of the garden towns which have preceded it, there will be a significant reliance on the town it is attached to. Residents are almost certain to travel into Sittingbourne to make use of facilities that either don’t exist or are yet to materialise from the new development. The dependency on Sittingbourne for rail alone should not be underestimated especially with the majority of new housing serving the needs of people from outside the borough, especially London where existing employment commitments will necessitate a continued use of the railways. Like it or not we are a commuter town and simply ignoring that fact isn’t going to change anything. There will no doubt be some notion or other that a massively expanded Kent Science Park will provide ample local employment opportunities, but this is a huge leap of faith and one not based on past performance. Whilst the Kent Science Park have enjoyed some success over the last 14 years, and I certainly don’t wish to diminish the gains in employment made, the average of 57 jobs per year created based on their published figures is simply not a game changer from a borough wide perspective. The emphasis on road infrastructure is also self-defeating as it will only serve to encourage the continued use of the car. For those that can’t wait for a new motorway connection, just remember that there will be a 50% increase in Sittingbourne’s population as a result of this scheme alone. So, we are doing this to meet housing targets? No, well certainly not at the moment anyway. 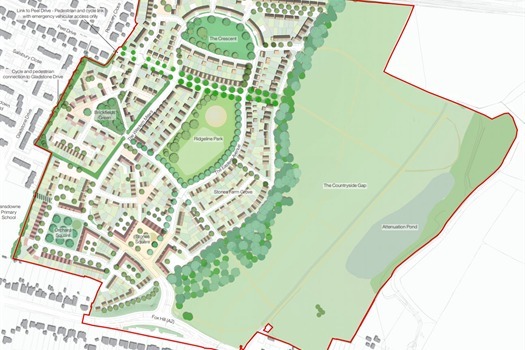 The garden town concept is being heavily promoted by Swale Borough Council who shortly after Quinn Estates submitted their scheme in the summer of 2016, immediately wrote to the Department for Communities and Local Government in support of it. The governments announcements on the possibility of increased housing numbers, which still have not happened, was not until a full year later. The Council have been planning for this for at least 2 years that we know of. Given the secrecy that seems to surround the dealings between SBC, land owners and Quinn Estates etc it would be interesting to know if the grubbing of not over old orchards and arable land being left fallow rather than sown for next year is of any significance particularly as it seems to tie in with the map of the proposed area of development in the Rodmersham area. Given their past track record, anything which may suggest involvement with SBC’s grubby paws has to be viewed with suspicion. I lived at stones farm for 24 years I only hope they made a good job of filling in the wells in the gardens ? Many happy years there even the bomb 50 yards away did not drive us out. Don Stedman. Ok, so my first question for you Jo, is what would be the appropriate level of development for Swale? Having spent 10 years negotiating our way through numerous consultations, gaining agreement on housing provision, then increasing it in line with the objectively assessed need, which incidentally has just been revised downwards and wasting a huge amount of effort on adopting a local plan which is supposed to last until 2031. We have reached a number, but you are arguing that the number is wrong so please do tell us what is the right number and why? Thank you all for your quick and predictably irrationally angry replies. I can, fortunately, confirm I am in no way related to Boris Johnson. Age has a lot to do with the overall sentiment that prevails when talking about developing our nation. We have been blighted by ancient people refusing to plan into the future and it has left us with the broken housing market we now contend with. Furthermore, I find Di's lack of business acumen concerning. Property development as a whole in Sittingbourne is not very viable (because who really wants to live near here by choice) than say Royal Tunbridge Wells or Weybridge. This expansion will help young people who want to buy new houses - a large increase in the local housing stock will inevitably result in a cooling down of the local property market. Young people who work hard (and smart!) support this development precisely because the houses developed in garden cities are not the 'affordable' shoe boxes often found in those hideously over-packed developments in tiny fields like the Eden Estate. Hard-working young people are willing to pay more money for spacious executive homes. The arguments about infrastructure are always peddled when any new expansion is mooted. If you study the history of Sittingbourne during the post WW2 period you will see that the town expanded rapidly (to a larger extent than this garden city) and the same arguments about infrastructure were raised - but thankfully the local authorities at the time ignored them. In reply to Chris's comment "This is nothing more than a money making scheme" - that is generally the point of these developments. If you wish to take the risk of investing £100's of millions of your own money into risky developments like these in areas like Sittingbourne (which suffers from low property values due to a lack of development of executive housing) please feel free to do so. The fact that this scheme has already been approved and fast-tracked by the incredibly talented and hard-working members of the LEP and LA's really demonstrates what an amazing opportunity this is for the local area. Jame's conspiracy theories about hard-working local people who give up their time and risk their money to give back to the local area remind me much of the gibberish peddled by Alex Jones over the pond. Don't forget the local elections in May 2019. Vote for the independants and maybe the Bowels puppet and puppet master Quinn need to be removed and maybe some perspective can be gained. Interesting that you should mention the timescale, the councils consultant had this down as something like a 45 year build out, but Quinn Estates I believe are suggesting 20 years. The plans are particularly poorly thought out, ignoring the destruction of ancient woodland and quality farmland there is no real consideration for water and sewage infrastructure, roads, schools, healthcare etc. There is mention of 4 primary schools and 2 secondary schools and a health centre but no associated funding. The current road infrastructure is not suitable and there is no plans to improve rural roads - Hawk's Hill Lane/Bashford Barn Lane are already a main route to Maidstone despite being single track -imagine another thousand plus cars. This is nothing more than a money making scheme. The only positives are given SBC past record it could be decades before anything happened given the speed of Sittingbourne Reborn and even at record speed housebuilding rates this is a 50 year development and by then we might need it if North Sittingbourne floods due to global warming! What does age have to do with this post? Surely this many new houses will affect us all! We need some new housing, yes, but will this massive expansion help young adults who are trying to make their first house purchase? No, because most of the housing will NOT be social, or starter housing but houses priced far beyond them! We all know what happens, developers build their big houses , then go cap in hand to council saying they have run out of money to fulfil all their social obligations- schools, doctors, play areas etc. Make developers build the amenities first,THEN allow the house building- or at least insist each part of the development can not continue until a percentage of amenities are built at the same time, so that amenities are completed before the last house is built. Well said Andy, you poor sad old man! I think he must be Boris’s brother - talks the same sort of nonsense. I was waiting for that comment, and I think you really should do your homework before making such remarks. Very happy to have a sensible conversation, but simply suggesting that I am a NIMBY because I have spoken about a housing development is fairly predictable. Oh and just so you are clear they are building over 600 homes on my doorstep already, more than doubling the size of the village. This scheme goes way beyond the village in which I live. The NIMBYism is very strong in this post. Old people with nothing better to do in their lonely, sad lives than moan continously about any new housing to protect their property values hold back Sittingbourne - and indeed the nation - from truly becoming 'Great' Britain.